As Catholics, we have a great history that includes meat-free Fridays, vegetarian contemplative orders and powerful social justice statements, writes Mercy Sister Elizabeth Young. Isn’t it time to reassess our eating habits and stand for compassionate consumption? I visited my family farm last year during calf-weaning time. The separation of adult cows from baby calves led to full days and nights of desperate, heart-wrenching moos. Sorrow rose in my mind and, more painfully, my gut. And I realised that, although growing up on the farm, I’d never heard those ‘noises’ as cries before. What was changing? Slowly, as I mature, I’m learning to hear God speak, in “both the cry of the earth and the cry of the poor”. Pope Francis has challenged us all in Laudato Si’ to ecological conversion, following Saint John Paul II, but also to clearly connect the environmental justice movement with our faith – to connect mooing cows with church prayer. I’ve often struggled to explain this link in my conscience-based choice not to eat meat. However, along with environmental and health arguments, the key value in my choice is compassion. And like me, I believe many more Catholics, moved by compassion, will revert to eating less meat and adopt a ‘climatarian diet’ for the twenty-first century. What could be more central to Catholicism than compassion? Think Project Compassion, respect for a consistent ethic of life and intercessory prayers. Compassion is part of our fabric and we work hard at it. Our faith calls us to develop compassionate hearts in children and listen to the cries of the needy, lest we act like the rich man living by Lazarus. This is a leap forward from the natural human instinct to only care for one’s own. Pope Francis, however, asks us to widen our hearts even further, to connect the Gospel imperative “to the ends of the earth” with justice for all that suffers in creation. Laudato Si’ affirms, “when our hearts are authentically open to universal communion, this sense of fraternity excludes nothing and no one. It follows that our indifference or cruelty towards fellow creatures of this world sooner or later affects the treatment we mete out to other human beings”. In other words, our lack of compassion for other creatures reflects our lack of compassion for suffering humanity. As with all of life, they are interconnected. Our daily bread is a concise summation of the gifts of water, sun, earth, nutrients and human labour. Each mouthful is a blessing, but also a taking of the earth’s resources that may involve long food miles, slave labour or needless harm to animals. The Church has been quick to promote ethical and slavery-free items such as coffee and chocolate. However, there is little said about the great harm and suffering caused by excessive meat consumption. Our nation responds with compassion when we see the suffering of animals transported to cruel slaughterhouses in neighbouring countries. In 2013, an Australian study confirmed a link between slaughterhouses and violence. This study found that the killing of any creature affects not only the animal, but also the killer. The environmental imperative is also becoming more and more evident. Livestock agriculture accounts for a large proportion of Australian greenhouse gas (GHG) emissions. Some researchers put the figure at 50 per cent, depending on what is counted. The UN World Food Program estimates that almost half of the staple foods of developing countries are fed to animals bred for human consumption instead of entering the markets. Clearly, our eating habits can have harmful effects that travel back through the chain from planet to plate. The ecological footprint calculator on the World Wide Fund for Nature website shows that the more animal products we eat, the greater our ecological footprint. So, how can we be more compassionate? There are simple changes that can be made. The UN Environment Program considers that a shift away from meat-based diets can save the world from hunger and the worst impacts of climate change. The non-profit organisation Less Heat Less Meat promotes the climatarian diet: “choosing what you eat based on the carbon footprint of different foods, and using your power as a consumer to drive down the production of meats which have the biggest impact on our climate”. The organisation asserts that a reduction of meat consumption by 25 per cent could reduce agricultural GHG emissions by 51 per cent. A climatarian diet benefits our bodies, too, our “temples of the Holy Spirit” (1 Cor 6:19). The World Health Organisation has officially identified processed meat as a Group 1 carcinogen, definitely a cause of cancer. Along with DDT and mustard gas, red meats are categorised as Group 2A substances that probably cause cancer. A 26-year study of over 120,000 people found that a reduction in meat consumption can reduce the risk of mortality through type 2 diabetes, coronary heart disease, stroke and certain cancers. As Catholics, we have a great history that includes meat-free Fridays, vegetarian contemplative orders and powerful social justice statements. Isn’t it time to reassess our eating habits and stand for compassionate consumption? Along with our other efforts to address the cry of the earth, we can ensure in a climatarian diet that our daily bread becomes a blessing to all of creation. 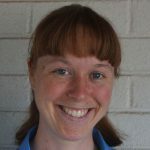 Elizabeth Young is a member of the Institute of Sisters of Mercy of Australia and Papua New Guinea. Most recently she has been working in youth and young adult ministry in the Diocese of Port Pirie, South Australia. In that time she has been a friend to asylum seekers in detention and refugees in the community. She also writes as part of the Australian Religious Response to Climate Change.